I subscribe to two weird magazines. One is Bulletin of the Atomic Scientists. The second one, as I learned right now is defunct. So I subscribe to one weird mag. In any case, the magazine was called “Listener”. It was a renegade audiophile magazine. 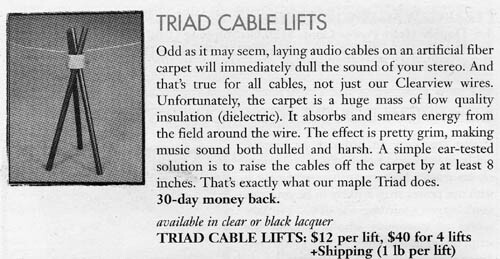 This magazine was against Home Theater and solid state electronics in general. They concentrated on vacuum tube (valve if you are British or thermionic if you are really old) technology and analogue sound in general. You see, there is this group of people who believe that analogue technology is far superior to digital in sound reproduction. They say that solid state devices will never replace the vacuum tube and CDs will never replace LPs. Those who do use CDs prefer to use tube amplifiers. It may surprise you to know that there are literally hundreds of companies that manufacture only turntables. There is a bunch of Russian and Chinese companies that still manufacture and sell vacuum tubes, Sovtek being the most famous. Lots and lots of companies are making vacuum tube amps. And I am not just talking about DJ equipment and guitar amps. No, they are making honest to god consumer stuff. Somebody even made a motherboard with vacuum tube based sound card or something. Of course vacuum tube stuff is expensive. There are systems that cost in the hundreds of thousands of dollars. There are cheaper ones, going for just mere thousands. And then, on eBay, you can purchase old cheap equipment for hundreds. But some audiophiles don’t stop at that. No, no, no. Once they get going there is no stopping them. They purchase vibration free platforms not just for turntables, but for ALL of their equipment. They say that vibration muddies up the sound. They buy cables made of exotic materials. They buy special power supplies that “scrub” the electricity. See a hilarious cartoon about this here. Oh, but some even run their equipment entirely from batteries. This made me laugh hard.